Our Red Agate owes its name to incredible multi-layered flavors and scents and inviting intense reddish-brown color. 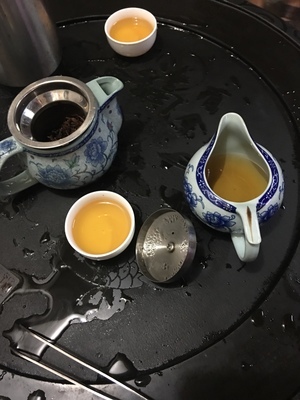 Processed like the popular Qimen tea, but grown in the clean unique environment of Sichuan province, this tea can surprise you with all – plumper intense reddish-lack color dry leaves with lively golden edges, strong aroma and flowery notes, delicate sweetness and alluring color. the malty flavor is right there in my face but I do get some passing tastes of chocolate and honey. I dumped the rest of my sample packet in the steeper for this cup. It is extra malty and earthy. I want to describe this as roasted chocolate mushrooms with citrus, but I really doubt that sounds appealing to anyone and I wouldn��t want to deter anyone from this yummy tea. Tea of the morning��.. I have not had this one in a while. I love gong fu black tea. OK, I like the color, very tempting. The fragrance is also tempting. But it taste not so good, as my standard, too earthy. But, milk turn it much better than bare tea.